Logitech G910 Orion Spectrum Reviews: Mechanized keys plus customized macros are what makes Orion Spark exclusive. The current keyboard would leave even the Logitech fans in surprise with all its unusual extras. From lighting to programmable features, you can tweak each and every technicality. This is the only Logitech’s device to be ranked in our Best Keyboards for gamers list. The Logitech flagship mechanical gaming keyboard, the G910 Orion Spectrum (See it on Amazon), takes some of the best features of its lower-priced cousin, the G810, and adds on a few noteworthy items of its own like dedicated macro buttons, a removable wrist rest, and integrated second-screen features via ARX Control. The latter isn’t particularly great, but a well-designed keyboard backed up with smoothly actuating Romer-G switches and intelligent software keeps the G910 Spectrum near the top of the heap in the crowded mechanical gaming keyboard market. What is the Logitech G910 Orion Spectrum? Gaming keyboards are big business, with numerous companies trying to tempt cash out of gamers’ pockets – and that means they’re also willing to take a gamble with new features to try to make products stand out. The Logitech G910 Orion Spectrum takes a couple of big risks. It’s only the second keyboard I’ve seen to include proper smartphone integration, and it also abandons Cherry MX hardware for another brand of mechanical switch. 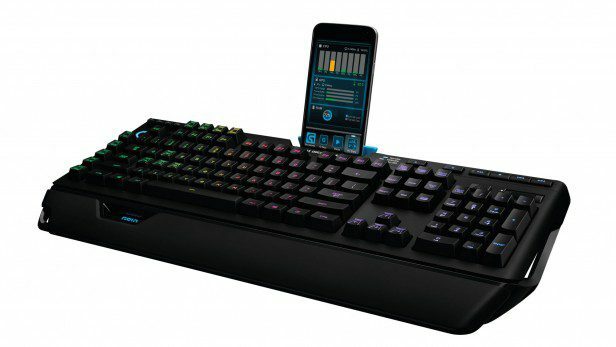 Smartphone integration is a relatively new feature on keyboards – the Roccat Skeltr is the only other unit I’ve seen with similar functionality. The Logitech has a small dock on its back edge that slides back to accommodate a smartphone or a small tablet, and the corresponding Arx app is available on Android and iOS. The app links to the keyboard and its PC wirelessly, and has some familiar features: one screen has CPU, GPU and RAM speeds and temperatures; another has media controls. The G910’s nine macro buttons can be programmed with basic commands in the Arx app, and game profiles can also be chosen. If you have a Logitech mouse, that can be monitored from within the app, too. The keyboard is largely made from plastic, but build quality is excellent, and its lights, cut-away sections and wide design is more sensible than silly. The closest thing to stereotypical gaming extravagance is found in the odd, futuristic pattern on top of the key gaming buttons. This keyboard is big, too: 505mm wide and 1.5kg on the scales. The Orion Spark is a mechanical keyboard, but it brings a totally new kind of switch to the table. 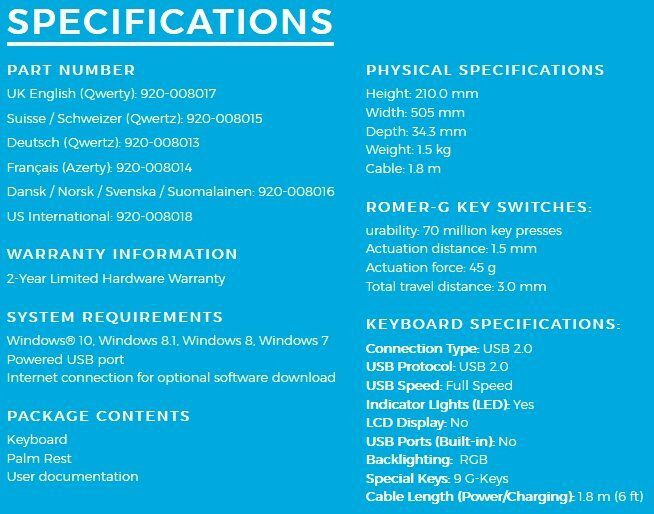 Logitech claims that its Romer-G switches are faster and more durable than competing mechanical switches. This may be true, but while the keys worked well, I did not notice a significant difference between them and the industry-standard Cherry MX switches. If you’ve ever used a device with Cherry MX Brown switches (or a reasonable imitation thereof), the Romer-G keys feel very similar to that. With a low actuation of TK g, registering keystrokes felt effortless, and the keys had a bit of tactility to them, even though they were fairly quiet. While they didn’t quite measure up to the Cherry switches, they’re not far off, and should please gamers who don’t like the clackety noise endemic to many mechanical keyboards. Logitech’s G910 Orion Spectrum is easily one of the best high-end RGB mechanical keyboards. Its macro setup is the best I’ve seen, and while it’s made of plastic instead of aluminum like some of its competitors, the G910 Spectrum and its Romer-G switches will keep your fingers happy. And moreover, your eyes will be delighted with its gorgeous lighting. Logitech's G910 Orion Spectrum is easily one of the best high-end RGB mechanical keyboards. Its macro setup is the best I've seen, and while it's made of plastic instead of aluminum like some of its competitors, the G910 Spectrum and its Romer-G switches will keep your fingers happy. And moreover, your eyes will be delighted with its gorgeous lighting.